Ten years ago most people used 3.5" floppy disks to transfer data from one PC to another and about five years later many people were burning rewritable CDs or DVDs. While we stuck at it because there wasn't really a good alternative, today's USB drives remind us that those ancient storage mediums were pretty horrible. Flash drives can be used on virtually any modern PC and not only do they offer much more storage capacity, they're also lots faster. Other benefits of flash drives include the much smaller form factor, and the fact that they aren't as vulnerable. Many people adopted flash drives with a capacity of 1GB to 4GB and as flash memory prices keep dropping significantly, memory firms are bringing new USB sticks to the market that offer huge amounts of portable storage capacity at relatively attractive prices. In this review I'm taking a closer look at the Patriot Xporter Magnum which offer a massive storage capacity of 64GB. You can fit about three Magnums in the palm of your hand - each of them offers more storage capacity than 90 of those old CD-Rs. 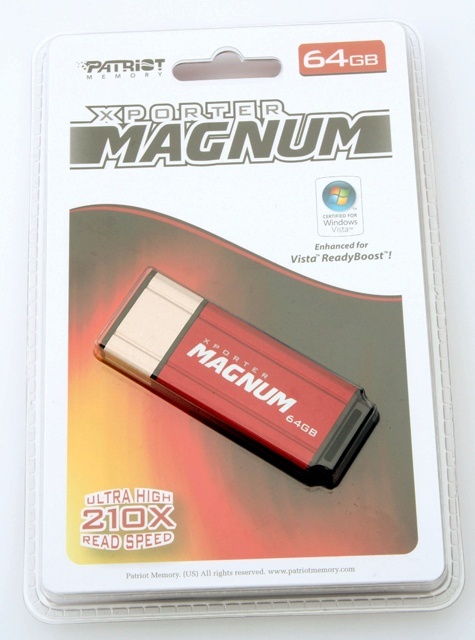 The Patriot Extreme Performance Xporter Magnum 64GB (PEF64GMNUSB) ships in a plastic clamshell package. This USB stick is part of Patriot's Extreme Performance lineup, it supports Windows Vista's ReadyBoost and has a performance rating of 210x. 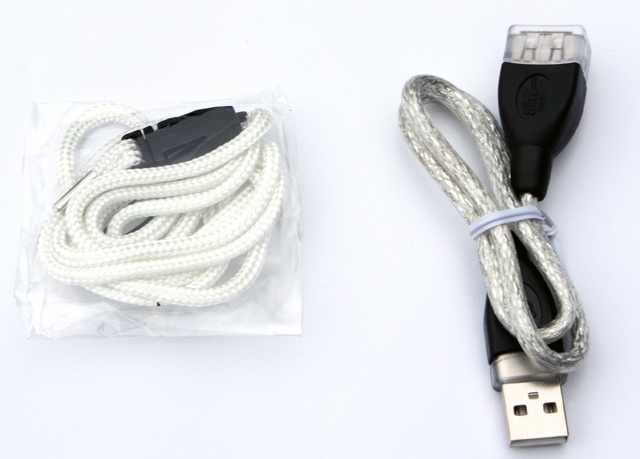 Inside is the drive and two accessories; a USB extension cord and a lanyard. The Xporter Magnum has a very stylish and sturdy metallic design. The drive has a bright red color, with black accents and a grey cap. It weighs just 19.5 grams and has about the same length as other high-performance flash drives like the Kingston DataTraveler 150 and OCZ ATV Turbo. It's a bit wider than most flash drives, but that's hardly a design flaw. The back of the Xporter Magnum 64GB looks very similar, it features Patriot's logo. One feature of this drive can't be seen on the pictures, the drive has a red activity LED but it's somewhat hidden behind the semi-translucent black plastic at the edge of the drive. The USB stick is rather thin but feels very sturdy. The cap can be attached to the lanyard hook by the way, so you won't be able to lose it. I read some reports on the web from people who complain the cap falls off easily, but my unit didn't have this problem.